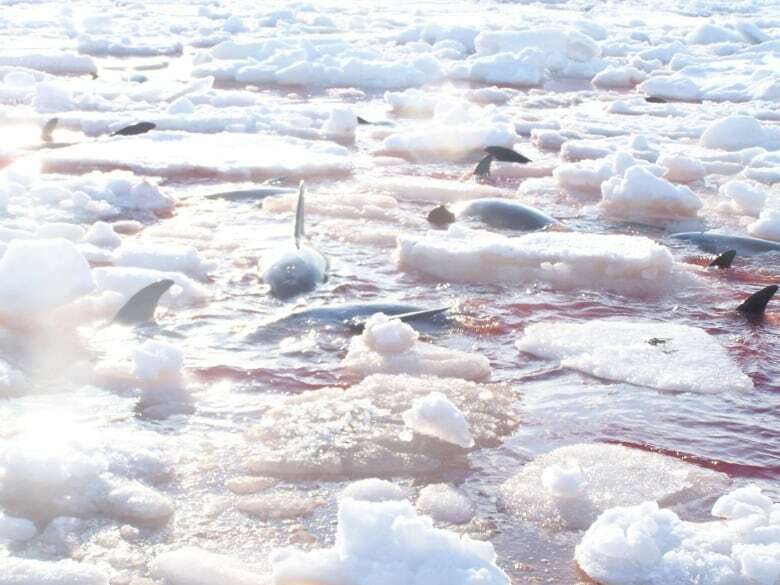 About 40 white-beaked dolphins have died in jagged pack ice near Cape Ray, off Newfoundland's southwest coast, a mammal rescue and release group says. The dolphins were first reported to be porpoises by local residents, but Wayne Ledwell, who is with the group Whale Release and Strandings, has confirmed the animals were dolphins, and all have since succumbed to the elements. Those included frigid temperatures and heavy ice that's still being pushed against the shoreline by strong westerly winds. "We first heard about them there Sunday, and some were already dead then," Ledwell said. "This morning, there were just a few still alive, but we believe they are now gone as well." He said there was little chance of rescuing or helping the dolphins escape, given the treacherous conditions with broken and jagged chunks of pack ice blocking the area. "It's not uncommon to see them in like this, and sometimes we're able to get to them and help. But in this situation, everything went against them. There really was no time to do anything." Bert Osmond, a resident of Cape Ray who watched the pod struggle over the weekend, said early Monday that he doubted they would survive overnight. Dolphins were seen struggling on Sunday trying to unsuccessfully free themselves from ice-packed shores near Cape Ray, in southwestern Newfoundland. (Courtesy of Bert Osmond)​"I don't [think] any of them survived, with the temperatures last night, –10, and the winds on land westerly," Osmond said. "It just drove the ice more tighter, and just drove the ice over them, I'd say." The dolphins struggled through the weekend to stay alive in shallow water with no easy way to escape from ice that is hugging the shores of Cape Ray. Osmond said the water had turned red with blood from the mammals, which were riddled with gashes suffered while trying to escape. "All you can see is water boiling up where they are trying get out and underneath the ice, trying to get air," said Osmond, who recorded video showing the dolphins corralled in the ice. He said federal fisheries officials were notified, although he said there was little they could do to break the ice apart. "They [have] no food, because where they're to is shallow water, and they're on the rocks and parts of them are sticking out of the water," he said, adding he has witnessed heartbreaking moments, particularly with calves. "There was two together, and the young one was almost like a little kid crying."